by Bill Dwight on Monday, October 15, 2012 at 12:26 PM | LEAVE A COMMENT! Your kid’s financial education: if not you, who? Are we creating a generation of entitled kids? 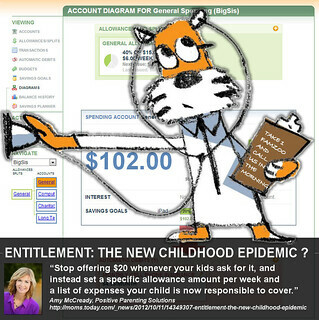 Your kid’s allowance: do you divvy? 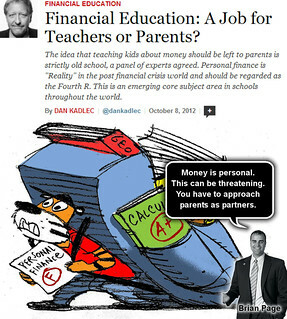 Is it up to schools or is it up to parents to teach kids personal finance? Dan Kadlec from Time’s MoneyLand recently hosted a panel on that classic debate. Professor Annamaria Lusardi argues: “The answer is no, this should not be left to parents.” She claims it’s for the same reason we don’t ask parents to teach physics. But, educator Brian Page points out: “Money is personal. This can be threatening. You have to approach parents as partners.” Good point — money and values are intimately intertwined, and that makes personal finance a stickier topic than say math and physics. Also, the fact is, parents are the main source of the funds for kids. For habits to stick, kids need to practice on a regular basis with real money. Ideally, both parties would play a string role in a child’s financial education with an emphasis on concepts by teachers and an emphasis on regular application/practice by parents. At FamZoo, we’re applying mobile and web technology in an attempt to significantly lower the bar for parents to be effective money mentors to their kids. That doesn’t obviate the need for getting financial literacy in our schools, but we simply can’t afford to wait around for that to happen either. Otherwise, as per the end of the article, we may be Waiting for Godot. Read more quotes and commentary here. Related FamZoo Activity: See how a Virtual Family Bank helps parents be better money mentors. We can certainly help with that last one. Read Amy’s advice here. Related FamZoo Activity: Set up a specific allowance. When it comes to allowance, do you divvy? Jennie writes a column called “Ask the Mompreneur.” Last week, she interviewed Ginger Wagoner who revealed one of her keys to raising an entrepreneurial kid: divvying up allowance. To reinforce the importance of “budgeting, thinking ahead, prioritizing, and even giving back to the community,” Ginger divvies up her 10 year old daughter’s allowance into 5 categories: spending, gifts, school supplies, savings, and donations. Read more here. Do you do allowance splits? If so, do you dictate the categories and the split percentages? Maybe a middle ground? I like to say to the kids, “Hey, we’re going to divide your allowance or chore payments between spending, saving, giving (or whatever categories make sense in your family) — what percentages would you like to pick for each?“ In other words, the parent sets the high level guidelines like the split categories, and the child picks the percentages (as long as each is north of zero!) based on an informed conversation. That’s worked well in our family so far. 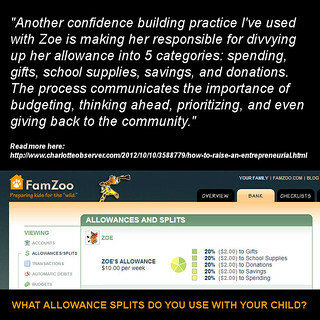 Related FamZoo Activity: Adjust allowance splits. We’re constantly scouring the Internet looking for articles related to family finances and teaching kids good personal finance habits. You can visit our ever growing list of family finance bookmarks here. We’re up to 2,941 now!